Announcement of Book "Acclimatization to Extreme Conditions" and Film "Prevention of Natural Focal Infections in SAF"
Home » Public Relations » News » Announcement of Book "Acclimatization to Extreme Conditions" and Film "Prevention of Natural Focal Infections in SAF"
The announcement of the book "Acclimatization to extreme conditions" by Prof. Dr. Sonja Radakovic, Head of the Preventive Medicine Sector MMA, as well as the film "Prevention of natural focal infections in the Serbian Armed Forces, by Colonel Prof. Dr. Radovan Cekanac, Assistant Head MMA, organized by the Media Center "Odbrana", will be held on April 2, 2015, at 13:00 in the Conference Hall of the Central Military Club. Acclimatization of the human body to the extreme environmental conditions, being the field of great military medical importance, is the subject of this book. The book is based on the relevant international literature in this field, but also on results obtained during thirty years of research in the MMA climate chamber. 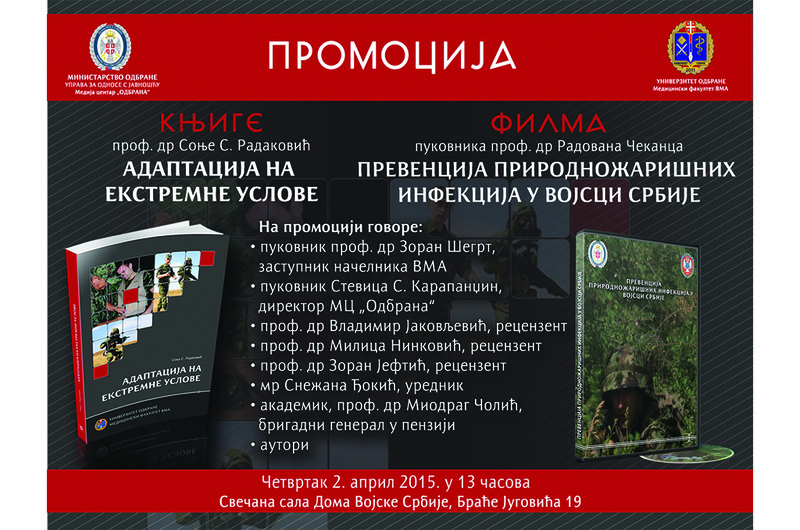 The Acting Head of the MMA Colonel Prof. Dr. Zoran Segrt, Colonel S. Stevica Karapandzin, director of the Media Center "Odbrana", reviewers prof. Dr. Vladimir Jakovljevic, prof. Dr. Milica Ninkovic, prof. Dr. Zoran Jevtic; Snezana Djokic, editor, academician Prof. Dr. Miodrag Colic, retired Brigadier General and authors will offer insights of the book and the film to the audience. News Announcement of Book "Acclimatization to Extreme Conditions" and Film "Prevention of Natural Focal Infections in SAF"